Well, technically we didn't have a vote on whether the contest should be held next year or not (as opposed to the previous year). Does that mean that there will be no contest next year? No. The general assembly is just one decision making body of the club ("Verein"). German law ("BGB") states that the statues of the club have to define which body of the club has which powers/rights. I don't know ABBUC's statues in detail, but hardly any club gives the general assembly far-reaching powers down to the level of individual activities, including financial matters. That is what the headship ("Vorstand") of the club is voted into office for. So unless anything else is written in the club's statuetes, the club's headship can act independently of the assembly (including spending large sums of money) as long as there is a majority decision within the headship and the activities don't run counter the interests of the club. Of course, if there is a proper motion tabled at the assembly (which requires that this motion is part of the assembly's agenda ("Tagesordnung") and this agenda is delivered to all members within the invitation deadline), then the club' headship cannot act against such a decision. One example this year was the idea to make the sending out of disks with the magazine optional. Currently, this is not possible because the shipping of disks is part of the statutes. To change the statutes, it would have to be part of the assembly's agenda, but the move for this was only made after the invitation with the agenda has been sent out, so no change was possible (this year). What we have done in the past (at least in the last three years) is an opinion poll at the assembly. Nothing more, but also nothing less. Based on this, the headship can then decide whether to follow up upon this - or not. Of course, in the interest of a good climate in the club, the headship will usually do this, but it could modify the way things are run if it sees it in the club's interest. For example, for the software contest, we voted on rather general changes, but not about the exact wording. As in the past, this will be finalized between the ressort heads and the club's headship. If there had been a "proper" vote on exact wording, we couldn't do that (except in a few circumstances). In the case of next year's hardware contest, people are probably assuming that things are continuing the way they have been, including having a jury, so it would probably not appease the situation to just depart from the current system without a discussion. Nevertheless, if the headship were interested in taking up JAC's and others' suggestions, the headship could for example decide to open up voting to all members (and not just those present at the JHV). This way, the general modus operandi of the hardware contest would still be the same because we would still have a recommendation of the jury with a suggested placement, but the members would be voting individually before or at the JHV. If required/desired, the online voting portal for the software contest could easily be mirrored for the hardware contest for that purpose. Well, the first paragraph is more or less the gist of the longer text in the magazine, isn't it? But if the other paragraphs regarding my motivation or the usefulness make it easier to understand, then I'll put that in into next year's description . It's an interface to the Arduino world. You can run it without an Arduino with "passive" shields (such as relay cards which can be had for a few bucks) and control these relays with 2 or 3 POKE commands, for example to control your model train. Or you can access more sophisticated boards, such as sensor boards or the Ethernet shield throug which you can access the internet. This requires a small program on the Arduino (just a good dozen lines of code) and then the Atari can tell via the R: handler what website it wants to access (of course within the limitations of the memory of the Atari). Since the Arduino has only 32k of program memory and 2k of RAM, you could theoretically port the code and libraries used to the Atari as well and run also these more sophisticated shields without the Arduino. But that would be more a show of proof of concept because a similar distribution of workload is also done by peripherals such as the 1050 etc. which has its own processor. At the JHV, the demo program which is shown on the video was also running and displayed the text of a small website and displayed the temperature of a sensor. Whether this is useful to people probably depends on what you want to make with it and your Atari. Probably not, if you're a gamer. Then AntiX is definitively more useful. But I really like the "maker" scene and I'm into home automation and have two other projects where I pimped both my old heating system as well as my lawn robot to make them accessible via the internet and monitor/control them. So I thought it would be cool to do something similar with the Atari to show it could also do this stuff. I wrote a little program with which I can control my heating system (via the relay card) based on the room temperature (derived from the temperature sensor) and the outside temperature (retrieved from a website). It's just a couple of lines of BASIC code but in the end it does the same as much larger applications do as well. It might be more interesting for a larger user base if the club really goes through with what Carsten outlined: That the new website and services should be accessible for the 8-Bit Atari as well. Then you could write a program on the Atari to access the club's portal with hardware that costs around 30 Euros in total. It was (and still is) a bit difficult for me to see what kind of audience the docs should be gearing towards, especially as there is no single or unique use-case. As at least some programming knowledge is required, I went for documented code. For next year, I may write a little tutorial for one or two example use cases, but then again it's a question of where to begin and where to stop - could I assume that people using AtariDuino know how to flash a sketch on the Arduino? And if they know programming, would they understand basic C programming (required for programming the Arduino as well)? A lot of these things are already explained at lenght on the internet (and probably much better than I could ever do it). It would probably be much easier if I would submit one unique plug-and-play application such as an "internet kit" where AtariDuino is a part of, where the code is already packed onto the Arduino and the full set is distributed as a whole. But I rather want people to be creative and think about their own ideas what you could now connect with the Atari and how - just what you do in the "maker" community. But maybe that clashes with the expectations of others, who want to have a "finished" product with a clearly defined use-case - which is also understandable. Then your "observation" rather shows that attending the assembly proves nothing. Regarding the incomplete docs that you mention, the supposedly missing PCB layout was in the official document folders that Wolfgang as the club president brought to the assembly, and even Wolfgang apologized during the debate that they must have somehow overlooked it. As for the supposed bad quality of the schematics, these were sent in electonically (and attached for reference here), so everybody can make their own evaluation whether they look like a "photo copy of a photo copy of a ..."
But what is actaullay bordering defamation is your claim that the hardware presented at the JHV was not the same build quality as what was submitted before the deadline - may I ask how you come to that conclusion and what are the supposed differences in "build quality"? 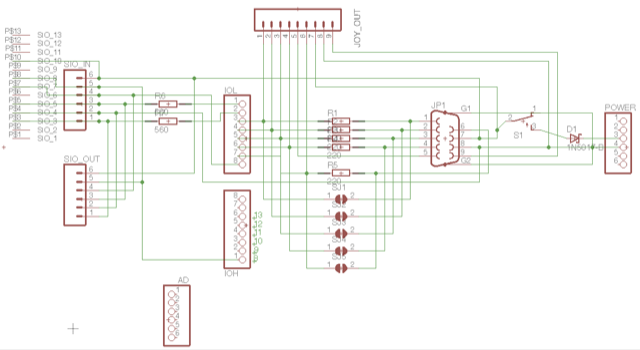 The thing is that currently only one (fullly working) set of the AtariDuino exists so far (because of the SIO/Arduino voltage issue that I'm currently working on with FloppyDoc who is kind enough to help in best ABBUC spirit to find a solution to this problem). This one set was sent in for the deadline and I only received it back in the morning of the assembly from Wolfgang and was happy to see that it still worked so I could demonstrate it to interested members. The other PCBs I brought were either unpopulated or did not have all the connectors soldered on, so if at all, the submitted sample was better than the ones I brought to the assembly. As I said, I don't know where you got your "information" on AtariDuino. Unfortunately, you didn't seem to bother asking me directly (I don't bite, even people who don't like me). So if it is just second-hand hearsay then just keep it to yourself. I just don't hope it comes from members of the jury after we had the discussion, because this would certainly discredit the impartiality of the jury institution. Again, no-one (except the author) complained at the annual meeting, the Abbuc members were quiet and indifferent as always (or had left the room since they do not like these boring and endless discussions). But to me it seems obvious, that the jury is not neutral ! I'm sorry, but at 6:48 PM local time here, everyone was already having dinner and the voting was done two hours ago. I don't really understand why people wait almost two months to cast their vote. A few days ago, 12 people had voted, but this afternoon it was 23 and yours would have been the 24th, so 50% vote within the last two days (and others seem to have liked to wait one more week ). Why was everyone so keen on having the games available at the earliest possible moment and then forget/don't bother to vote? Ok, the results are in! Some have you have already cast their votes online, but just in case someone missed it: Online voting is already open at http://asc.abbuc.de- all you need is your membership number and your address (as spelt on the address sticker of the ABBUC magazine) from which the initial password is generated. In case you have already requested a new password from the system last year, you have to use this one instead of course. Enjoy! Can we have pictures / videos please? What can we play this fall? Thanks also to ChariieChaplin's tireless efforts, you have not only pictures/videos, but also the disk versions online four days after the deadline (members only, as usual). Just go to http://asc.abbuc.de and read about the composition of your username and password (maybe you saved it in your browser last year, then you don't have to think about it ) and go to the link on the bottom of the page. Enjoy. @1NG: Feel free to put up all these suggestions to vote at the GA. If they get majority support, I'm fine with it. But I'm out of the discussion when you keep saying that we are "hiding" behind the rule as if we had a sinister motive, when you insist that money was the reason although I've explained at length the rationale behind our decision. We knew right from the start that the decision wouldn't be liked by everybody, especially the programmers involved (which is perfectly understandable) and that's why we were saying already in the first e-mail to you that we can and should discuss about this at the GA. And I'm sitting here in the middle of the Swedish countryside, halfway through my annual leave with just mobile phone internet. Do you really think that in that situation I bother about whether anybody gets a cup or 50 Euros or whatever? I (and all others involved) do this in my free time because I take the tasks seriously that I have been voted to do by club members at a time when nobody wanted to do this job - because it's part of my hobby, not because I want to make other peoples lives miserable. If I did not take it seriously, it would be a waste of my (due to three kids under four years very limited free) time. If you disagree with our decisions, come up with concrete constructive criticism and we can take it from there. But do not expect us to change the rules on the fly just because you or anyone else says so. If you would handle it that way, fine. I (honestly!) don't mind passing over the position of head of the software ressort to you if you want. @emkay: The members have (at some point, before I was even an ABBUC member) decided on these rules, probably for a reason. They are not misleading, they rather do not cover every possible situation. You have the same thing with laws in real life, and that's why you have judges or jurys to make decisions. Just because you don't like a decision of a judge or a jury, would you seriously suggest to have a vote by all citizens on that matter (apart from the fact that we don't have current e-mail addresses from more than half of the 400+ ABBUC members)? Maybe every time someone doesn't like a decision? Good luck with that. We'll have a vote on the future of these rules at the GA (and if you want, also on the next head of the software ressort, I don't mind). Then you can do away with every rule you think is nonsense or with the whole rule-set completely, provided the majority of the fee-paying members concurs. @1NG: Thanks, I also think less emotions in this respect are better. And maybe some constructive criticism, such as how people who want the rules to be changed would suggest how the rules should be phrased in the future. Then we'd already have some concrete options to be discussed at the GA. But again, neither GU2 nor RoA was "prefiltered" because anyone thought the game was bad or that no money should be spent on it. I have said this several times now, but apparently it doesn't get heard.